...when you turn off all data connections! With all the radios and antennas switched off on my Nokia Lumia 920, the battery has lasted from the 28th October through to today, the 7th November. A total of 11 days! This has included some fairly solid use, listening to podcasts, audio books and music, as well as using it as my alarm clock. This is far more than I thought it would last, very impressed. See the gallery at the end of the post for pictures of how the battery was discharging. The spikes are when I was syncing the phone with the desktop to grab some new podcasts. I recently did a blog post about how I started using my old Nokia Lumia 920 as my alternative to both a TomTom and an iPod. Apart from a couple synchronisation issues between iTunes and the Windows Phone Desktop Application, I am happy to report that this little experiment has been going really well. I use the phone pretty much every day, listening to podcasts on the commute to work, and music while in the office, and also taking photos/videos of Alivia (that's our new-born baby daughter :-)). 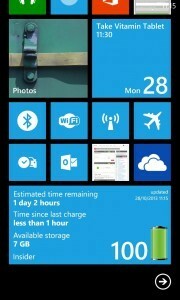 The one thing that has _really _stood out for me though is the battery life of the Nokia Lumia 920. As soon as you turn on flight mode, i.e. disabling all the data connections that the phone has to offer (Bluetooth, wi-fi, mobile, etc), the battery quite literally goes for days! 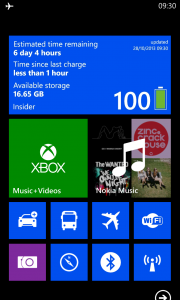 When using my Nokia Lumia 925 as a _phone, _I am lucky if I can go a day without needing to charge it again. Today I charged the 920 for what I think is the first time since I made the switch to using this device as my media device, although I think I must have charged it in between, otherwise it would have been over 2 weeks without a charge, which would be a bit of a stretch I think. I firmly believe that the Nokia Lumia 925 will need charged tomorrow morning, but I am very curious to see how the Nokia Lumia 920 lasts before needing another charge. In addition, here is a gallery of how the battery was discharging through the 11 days that it was being used. Very impressive!